I reland's northern neighbors in Scotland enjoy the "Home of Golf" label, but Irish eyes may have smiled upon the game's beginnings. According to some his- torians, Irish monks crossing the North Channel of the Irish sea brought with them to Scotland's Machrihanish area a ball-and-stick sport similar to modern hurling. Legend has it that the game evolved into something closer to today's golf, and made its way up the Mull of Kintyre to Edinburgh and St. Andrews. Whether that's true or blarney, Ireland remains an integral part of golf's history – and one of the most desired destinations for U.S. travelers inter- ested in authentic links golf. From Northern Ireland gems like Royal Portrush and Royal County Down to the sublime southwest, which features names such as Ballybunion and Waterville, there's great golf to be found throughout the country. And since the island is a manageable size – 300 miles from north to south – golf travelers can often hit multiple areas of the country within the same trip. 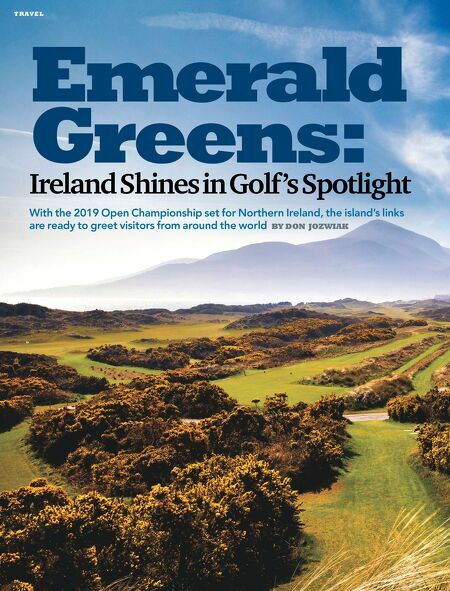 Golf's spotlight is shining even brighter on Ireland this year, as Northern Ireland prepares to host the Open Championship in July. 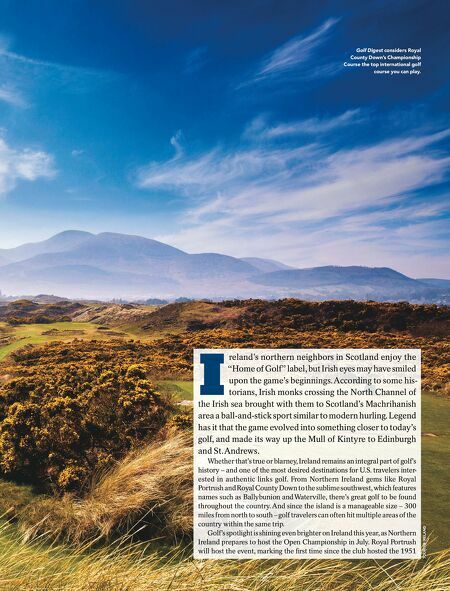 Royal Portrush will host the event, marking the first time since the club hosted the 1951 TOURISM IRELAND Golf Digest considers Royal County Down's Championship Course the top international golf course you can play.